However, with support of Ubuntu 14.04 winding down and Ubuntu 16.04 set as the next LTS (with support until April 2021), I thought it would be appropriate to create a new, updated Ubuntu + OpenCV install tutorial. Inside this tutorial, I will document, demonstrate, and provide detailed steps to install OpenCV 3 on Ubuntu 16.04 with either Python 2.7 or Python 3.5 bindings. Furthermore, this document has been fully updated from my previous Ubuntu 14.04 tutorials to use the latest, updated packages from the apt-get repository. To learn how to install OpenCV on your Ubuntu 16.04 system, keep reading. Note: Don’t care about Python bindings and simply want OpenCV installed on your system (likely for C++ coding)? No worries, this tutorial will still work for you. Follow along with the instructions and perform the steps — by the end of this article you’ll have OpenCV installed on your system. From there, just ignore the Python bindings and proceed as usual. Python 2.7.12 (used by default when you type python in your terminal). Python 3.5.2 (can be accessed via the python3 command). Again, it’s worth repeating that Python 2.7 is still the default Python version used by Ubuntu. There are plans to migrate to Python 3 and use Python 3 by default; however, as far as I can tell, we are still a long way from that actually becoming a reality. In either case, this tutorial will support both Python 2.7 and Python 3. I’ve highlighted the steps that require you to make a decision regarding which version of Python you would like to use. Make sure you are consistent with your decision, otherwise you will inevitably run into compile, linking, and import errors. Regarding which Python version you should use…I’m not getting into that argument. I’ll simply say that you should use whichever version of Python you are comfortable with and use on a daily basis. Keep in mind that Python 3 is the future — but also keep in mind that porting Python 2.7 code to Python 3 isn’t terribly challenging either once you understand the differences between the Python versions. And as far as OpenCV goes, OpenCV 3 doesn’t care which version of Python you’re using: the bindings will work just the same. All that said, let’s get started installing OpenCV with Python bindings on Ubuntu 16.04. The pkg-config package is (very likely) already installed on your system, but be sure to include it in the above apt-get command just in case. The cmake program is used to automatically configure our OpenCV build. OpenCV ships out-of-the-box with a very limited set of GUI tools. These GUI tools allow us to display an image to our screen ( cv2.imshow ), wait for/record keypresses ( cv2.waitKey ), track mouse events ( cv2.setMouseCallback ), and create simple GUI elements such as sliders and trackbars. Again, you shouldn’t expect to be building full-fledged GUI applications with OpenCV — these are just simple tools that allow you to debug your code and build very simple applications. Note: If you do not install the Python development headers and static library, you’ll run into issues during Step #4 where we run cmake to configure our build. If these headers are not installed, then the cmake command will be unable to automatically determine the proper values of the Python interpreter and Python libraries. In short, the output of this section will look “empty” and you will not be able to build the Python bindings. When you get to Step #4, take the time to compare your output of the command to mine. When new versions of OpenCV are released you can check the official OpenCV GitHub and downloaded the latest release by changing the version number of the .zip . Why are we bothering to download the contrib repo as well? Well, we want the full install of OpenCV 3 to have access to features (no pun intended) such as SIFT and SURF. In OpenCV 2.4, SIFT and SURF were included in the default installation of OpenCV. However, with the release of OpenCV 3+, these packages have been moved to contrib, which houses either (1) modules that are currently in development or (2) modules that are marked as “non-free” (i.e., patented). You can learn more about the reasoning behind the SIFT/SURF restructuring in this blog post. I also want to mention that both your opencv and opencv_contrib versions should be the same (in this case, 3.1.0 ). If the versions numbers do not matchup, you could very easily run into compile time errors (or worse, runtime errors that are near impossible to debug). I’ve mentioned this in every single OpenCV + Python install tutorial I’ve ever done, but I’ll say it again here today: I’m a huge fan of both virtualenv and virtualenvwrapper. These Python packages allow you to create separate, independent Python environments for each project that you are working on. In short, using these packages allows you to solve the “Project X depends on version 1.x, but Project Y needs 4.x dilemma. A fantastic side effect of using Python virtual environments is that you can keep your system Python neat, tidy, and free from clutter. While you can certainly install OpenCV with Python bindings without Python virtual environments, I highly recommend you use them as other PyImageSearch tutorials leverage Python virtual environments. I’ll also be assuming that you have both virtualenv and virtualenvwrapper installed throughout the remainder of this guide. If you would like a full, detailed explanation on why Python virtual environments are a best practice, you should absolutely give this excellent blog post on RealPython a read. I also provide some commentary on why I personally prefer Python virtual environments in the first half of this tutorial. The ~/.bashrc file is simply a shell script that Bash runs whenever you launch a new terminal. You normally use this file to set various configurations. In this case, we are setting an environment variable called WORKON_HOME to point to the directory where our Python virtual environments live. We then load any necessary configurations from virtualenvwrapper . To update your ~/.bashrc file simply use a standard text editor. I would recommend using nano , vim , or emacs . You can also use graphical editors as well, but if you’re just getting started, nano is likely the easiest to operate. Note: Calling source on .bashrc only has to be done once for our current shell session. Anytime we open up a new terminal, the contents of .bashrc will be automatically executed (including our updates). Now that we have installed virtualenv and virtualenvwrapper , the next step is to actually create the Python virtual environment — we do this using the mkvirtualenv command. But before executing this command, you need to make a choice: Do you want to use Python 2.7 or Python 3? The outcome of your choice will determine which command you run in the following section. Regardless of which Python command you decide to use, the end result is that we have created a Python virtual environment named cv (short for “computer vision”). You can name this virtual environment whatever you like (and create as many Python virtual environments as you want), but for the time bing, I would suggest sticking with the cv name as that is what I’ll be using throughout the rest of this tutorial. Figure 1: Make sure you see the “(cv)” text on your prompt, indicating that you are in the cv virtual environment. Figure 2: If you do not see the “(cv)” text on your prompt, then you are not in the cv virtual environment and need to run the “workon” command to resolve this issue. To access the cv virtual environment simply use the workon command mentioned above. At this point, all of our necessary prerequisites have been installed — we are now ready to compile and OpenCV! $ cd ~/opencv-3.1.0/ $ mkdir build $ cd build $ cmake -D CMAKE_BUILD_TYPE=RELEASE \ -D CMAKE_INSTALL_PREFIX=/usr/local \ -D INSTALL_PYTHON_EXAMPLES=ON \ -D INSTALL_C_EXAMPLES=OFF \ -D OPENCV_EXTRA_MODULES_PATH=~/opencv_contrib-3.1.0/modules \ -D PYTHON_EXECUTABLE=~/.virtualenvs/cv/bin/python \ -D BUILD_EXAMPLES=ON .. The above commands change directory to ~/opencv-3.1.0 , which if you have been following this tutorial is where you downloaded and unarchived the .zip files. Note: If you are getting an error related to stdlib.h: No such file or directory during either the cmake or make phase of this tutorial you’ll also need to include the following option to CMake: -D ENABLE_PRECOMPILED_HEADERS=OFF . In this case I would suggest deleting your build directory, re-creating it, and then re-running CMake with the above option included. This will resolve the stdlib.h error. Thank you to Carter Cherry and Marcin for pointing this out in the comments section! Inside this directory we create a sub-directory named build and change into it. The build directory is where the actual compile is going to take place. Finally, we execute cmake to configure our build. Before we move on to the actual compilation of OpenCV, make sure you examine the output of CMake! To do this, scroll down the section titled Python 2 and Python 3 . Figure 3: Ensuring that Python 2.7 will be used when compiling OpenCV 3 for Ubuntu 16.04. The Interpreter points to the Python 2.7 binary in the cv virtual environment. Libraries points to the Python 2.7 library (which we installed during the final step of Step #1). The numpy value points to our NumPy installation in the cv virtual environment. And finally, the packages path points to lib/python2.7/site-packages . When combined with the CMAKE_INSTALL_PREFIX , this means that after compiling OpenCV, we’ll find our cv2.so bindings in /usr/local/lib/python2.7/site-packages/ . Figure 4: Validating that Python 3 will be used when compiling OpenCV 3 for Ubuntu 16.04. Again, notice how my Interpreter , Libraries , numpy and packages path have all been correctly set. If you do not see the cv virtual environments in these variable paths, it’s almost certainly because you are NOT in the cv virtual environment prior to running CMake! 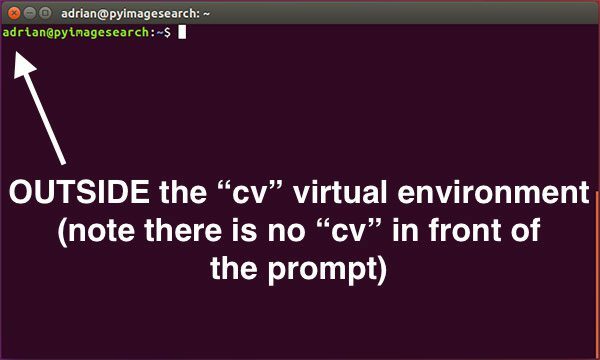 If that is indeed the case, simply access the cv virtual environment by calling workon cv and re-run the CMake command mentioned above. The -j switch controls the number of processes to be used when compiling OpenCV — you’ll want to set this value to the number of processors/cores on your machine. In my case, I have a quad-core processor, so I set -j4 . Figure 5: Successfully compiling OpenCV 3 for Ubuntu 16.04. You’re coming down the home stretch, just a few more steps to go and your Ubuntu 16.04 system will be all setup with OpenCV 3. Note: In some cases, you may find that OpenCV was installed in /usr/local/lib/python2.7/dist-packages rather than /usr/local/lib/python2.7/site-packages (note dist-packages versus site-packages ). If your cv2.so bindings are not in the site-packages directory, be sure to check dist-pakages . I’ve been puzzled regarding this behavior ever since OpenCV 3 was released, but for some reason, when compiling OpenCV with Python 3 support, the output cv2.so filename is different. The actual filename might vary for you, but it should look something similar to cv2.cpython-35m-x86_64-linux-gnu.so . Congratulations, you now have OpenCV 3 installed on your Ubuntu 16.04 system! Open up a new terminal. 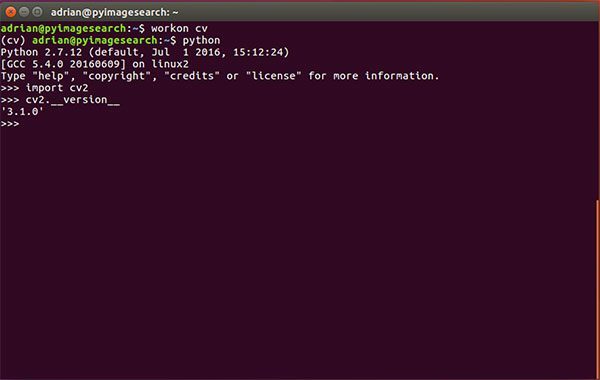 Execute the workon command to access the cv Python virtual environment. Attempt to import the Python + OpenCV bindings. As you can see, I can import my OpenCV bindings into my Python 3.5 shell. Figure 6: Ensuring that I can successfully import my Python + OpenCV bindings on Ubuntu 16.04. 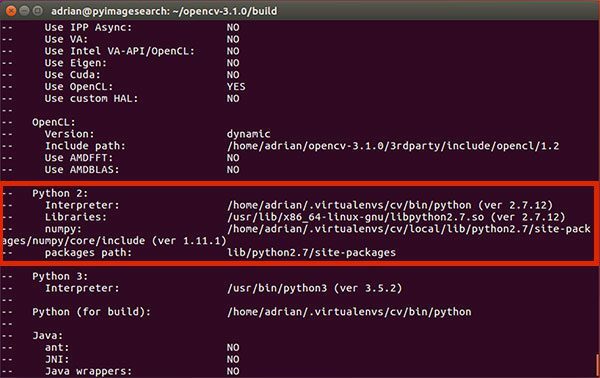 Thus, regardless of which Python version you decide to use, simply follow the steps detailed in this tutorial and you’ll be able to install OpenCV + Python on your Ubuntu 16.04 system. But again, be careful when running this command! You’ll want to make sure you have properly installed OpenCV on your system prior to blowing along these directories. Otherwise, you’ll need to restart the entire compile process! In this section, I address some of the common questions, problems, and issues that arise when installing OpenCV on Ubuntu 16.04. Q. When I execute mkvirtualenv or workon , I get a “command not found error”. First, make sure you have installed virtualenv and virtualenvwrapper using the pip package manager. You can verify this by running pip freeze , examining the output, and ensuring that you see both virtualenv and virtualenvwrapper in the list of installed packages. Your ~/.bashrc file may not be updated correctly. To diagnose this, use a text editor such as nano and view the contents of your ~/.bashrc file. At the bottom of the file, you should see the proper export and source commands are present (again, check Step #3 for the commands that should be appended to ~/.bashrc ). After editing your ~/.bashrc file, you may have forgotten to source it and reload its contents. Make sure you run source ~/.bashrc after editing it to ensure the contents are reloaded — this will give you access to the mkvirtualenv and workon commands. Q. Whenever I open a new terminal, logout, or reboot my Ubuntu system, I cannot execute the mkvirtualenv or workon commands. A. See reason #2 from the previous question. Q. When I (1) open up a Python shell that imports OpenCV or (2) execute a Python script that calls OpenCV, I get an error: Import Error: No module named cv2 . Make sure you are in the cv virtual environment by using the workon cv command. If this command gives you an error, then see the first question in this FAQ. If after you’ve ensured your ~/.bashrc file has been updated properly and source ‘d, then try investigating the contents of the site-packages directory in your cv virtual environment. You can find the site-packages directory in ~/.virtualenvs/cv/lib/python2.7/site-packages/ or ~/.virtualenvs/cv/lib/python3.5/site-packages/ depending on your Python version. Make sure that (1) there is a cv2.so file in this site-packages directory and (2) that it’s properly sym-linked to a valid, existing file. Be sure to check the site-packages (and even dist-packages ) directory for the system install of Python located in /usr/local/lib/python2.7/site-packages/ and /usr/local/lib/python3.5/site-packages/ , respectively. Ideally, you should have a cv2.so file there. If all else fails, check in your build/lib directory of your OpenCV build. There should be a cv2.so file there (provided that both cmake and make executed without error). If the cv2.so file is present, manually copy it into both the system site-packages directory as well as the site-packages directory for the cv virtual environment. …but I’m also willing to bet that you’re just getting started learning computer vision and OpenCV, and probably feeling a bit confused and overwhelmed on exactly where to start. Personally, I’m a big fan of learning by example, so a good first step would be to have some fun and read this blog post on detecting cats in images/videos. This tutorial is meant to be very hands-on and demonstrate how you can (quickly) build a Python + OpenCV application to detect the presence of cats in images. And if you’re really interested in leveling-up your computer vision skills, you should definitely check out my book, Practical Python and OpenCV + Case Studies. 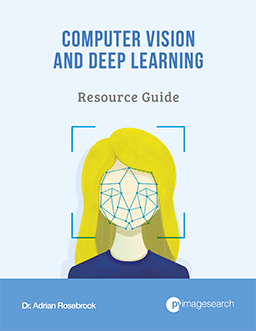 My book not only covers the basics of computer vision and image processing, but also teaches you how to solve real-world computer vision problems including face detection in images and video streams, object tracking in video, and handwriting recognition. So, let’s put that fresh install of OpenCV 3 on your Ubuntu 16.04 system to good use — just click here to learn more about the real-world projects you can solve using Practical Python and OpenCV. 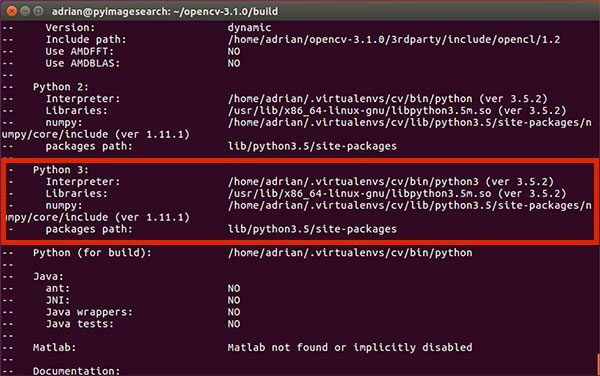 In today’s blog post, I demonstrated how to install OpenCV 3 with either Python 2.7 or Python 3 bindings on your Ubuntu 16.04 system. For more OpenCV install tutorials on other operating systems (such as OSX, Raspbian, etc. ), please refer to this page where I provide additional links and resources. If you’re interested in learning more about OpenCV, computer vision, and image processing, be sure to enter your email address in the form below to be notified when new blog posts are published! Thanks Adrian! This is my to-go site for installing openCV. I ran into a “404 not found” when trying to download opencv_contrib using the link indicated in the tutorial. How can I fix this? I was missing the .zip at the end, my bad! Congrats on resolving the issue Nico! For Ubuntu 14.04, I would recommend this tutorial. Thank you very much for share this steps. I am using openCV 3.0 on windows 10 and python 2.7, but some times I have had some problems when I want to re-installing these. So, it is really good to know you share this, as a source in case of need. Keep doing that way Adrian, I enjoy following your steps. Hey Adrian!, i have installed opencv and python in like 3 or 4 times on a raspberry and odroid and it has worked really good, however i have read about TBB enabling which allow us to run some opencv tools using all the cores in the device. Have you considered to add such feature during the install process? Regards. Specially with HAAR cascade training, which have reducing the training time in a very noticeable ratio. TBB (Threading Building Blocks) can certainly speedup OpenCV. I haven’t included it in this tutorial mainly because these tutorials are aimed at readers just getting started with OpenCV, not those who are trying to milk every last bit of performance out of OpenCV (and are therefore used to reading command line output and can diagnose compile errors). I’ll consider this for a more “advanced build” tutorial. What is your OS? Ubuntu Mate? I would like to install OpenCV on odroid to make some projects with USB webcam. Can you show me how to install the OS and OpenCV (the links or tutorials that you follow)? Great tutorial Adrian. Maybe I have asked this before but what is the difference between compiling opencv and instaling it via apt-get install python-opencv ? The python-opencv repository is older, outdated, and doesn’t include the opencv_contrib package. I cannot say this enough — I do not recommend installing OpenCV via apt-get. You’ll be missing features and be running an older, outdated version. Simply put: don’t do it. As of right now on Ubuntu 16.04, this gives me cv2.__version__ = 3.4.2, which was only released a few weeks ago as of this writing. So seems pretty up-to-date, and much easier to install than your instructions. Maybe for true beginners this is the way to go. I jump the following error: Configuring incomplete, errors occurred! has something to do that is doing this tutorials are in a virtual machine? I assume you are referring to the “cmake” command? If so, check the output of cmake — it will tell you what the configuration error is. Thank you!! working properly with python 3.5. This occurs in both a Python2 or Python3 environment. pip install scipy and then the pip install numpy worked. Strange, perhaps an improvement on your excellent documentation? This sounds like a problem with your internet connection. Double-check that you have a strong connection before continuing with the tutorial. note the 3. After that change all worked just fine. The “3” is not necessary. When you create the Python virtual environment the virtualenv/virtualenvwrapper commands will automatically sym-link the correct version of Python you chose using mkvirtualenv. you’re too late, I’ve managed this just some weeks ago. However, well explained! Do you think it’s worth uninstalling OpenCV and reinstalling it with virtualenvs? Do I have to install OpenCV for every project new? I highly recommend using Python virtual environments but they are not a strict requirement. You do not have to install OpenCV for every new project. The only thing you would need to do is sym-link in the cv2.so bindings into the site-packages directory. It’s literally one command that you would have to execute. I would encourage you to use virtual environments but at the end of the day it’s your choice. How do you exactly do this sym-link? I have followed the tutorial and everything was installed succesfully, however, I am trying to use Qt creator to program an OpenCV app and getting the error: “/usr/bin/ld: cannot find -lGL”. So, my question is, how do you link the opencv installation to each project? By the way, thanks for the tutorial, it is easy to follow and very friendly..
You can read up on sym-links here. So apparently I got mixed up in my Virtual Box images and I wasn’t actually running Ubuntu 16.04. My bad. I reran on 16.04 and it worked like a charm. Thanks for a fantastic and nicely detailed step-by-step! Hi Adrian, I finally have install opencv in a VM. I installed opencv and opencv_contrib Ubuntu 15.04 using your method and it worked fine. But after I restart my system, I couldn’t import cv2 again. Do you know what can be the reason? Great article. I followed the instructions in Ubuntu 16.10 and had some issues during the compilation phase – some header files were not found. I turned out that including -DENABLE_PRECOMPILED_HEADERS=OFF in the cmake command helped. Thanks for sharing Marcin. I personally haven’t ran into this issue but I’ll absolutely make note of it. I think I have a similar problem like Marcin. When i run the make I get a fatal error: hdf5.h: no such file or directory. And then re-run CMake and recompile. Another option is to instruct CMake to explicitly compile without HDF5. I can’t remember off the top of my head but I think the switch is -D WITH_HDF5=OFF. You could verify this by running ccmake .. and looking for the HDF5 option. Adrian Montero’s Comment did work! I also got the same library error. Yes Adrian Montero’s solution worked also for me with opencv 2.7. Additionally, you may want to consider deleting your “build” directory and re-running cmake now that you have the libhdf5-serial-dev library installed. Sometimes cmake does not pick up on these initial configuration differences if you do not re-run it. and still showing the same error. Is there something I am doing wrong? You forgot the “..” at the end of the cmake command. You correctly added the “-D WITH_HDF5=OFF” but you need to move the “..” to the end, implying that cmake will run on the next level up directory (i.e., where the source code is). For me the answer here: https://stackoverflow.comhttps://stackoverflow.com/a/44912342 worked perfectly. Thanks for the Tutorial! is has worked well until I ran into the same error regarding the stdlib.h: No such file or directory. I’m on Ubuntu 17.04 and tried to compile, but unfortunately the solution of Marcin Budny did not work. I removed the whole build directory first and rebuild it, also tried both python (2 & 3) environments but did not change anything. Do you have any suggestion what I could do? The build-essential package is important. Make sure you have it installed, delete your “build” directory, and then re-run CMake and make. I am trying to compile opencv-3.2.0 if this is of any importance. The standard development headers should be installed via build-essential. Take a look at this thread on the Ubuntu forums for more information and other possible suggestions. what is the command to remove the build directory and to rebuild it? And then re-run the “cmake” command we detailed in the blog post. Thanks Marcin!! Great tutorial, Adrian! Thanks for sharing this CMake command Carter! I know a few other PyImageSearch readers were having this same issue as well. Hey buddy! Where do we include this statement in the command, I mean the position? Yeah it was very useful also to me. great guide, but i’ve got to step 3, where im getting the error ‘no module named virtualenvwrapper’. any idea?? Hey James, be sure to check the “Troubleshooting and FAQ” section of this post — you likely forgot to install virtualenv/virtualenvwrapper and/or forgot to update your ~/.bashrc file. I am a spyder user myself. Fixed this issue by adding the “~/.virtualenvs/cv/lib/python3.5/site-packages/” directory in the PYTHONPATH manager, which can be found in the menu section above the top Toolbar (in Tools>PYTHONPATH manager). I just noticed that adding the cv2 path in the PYTHONPATH manager makes the cv2 available outside the cv virtual environment and I’m not sure that it something you wish to do, since Adrian (and a lot of other developers in the Python community) have stated multiple times that virtual environments are almost a “must use”. Maybe Adrian will leave further thoughts on this “solution”. Provided that the version of Python you are importing cv2 into is the same version OpenCV was compiled against, this will work. However, instead of updating the PYTHONPATH (which can include extra libraries along your path) I would suggest just creating a sym-link to the cv2.so file. what a very helpful tutorial is! but i have problem, when I did Step 4, no error appeared. But, unlike your result, mine doesnt have Libraries , numpy , and packages path in the list. I install Python 2.7 btw. then when i keep continue, I couldnt find any linked library when I did check ls -l /usr/local/lib/python2.7/site-packages/ (total 0) or dist-packages. but in dist-packages, it was total 364 items detected. how could be the problem? is it okay to ignore this thing? Congrats on resolving the error Kara! I seem to have the same issue, in that my CMake output in step 4 shows Python 2 with an interpreter but nothing else. No libraries, numpy or paths. As with Kara my Python 2.7 install seems to be in /dist-packages. Can you advise when you delete the build folder? Do you just mean you deleted the build, start the process over and create a new build folder? If I need to make a change to my CMake command, I first delete the “build” directory, re-create the “build” directory, and then run my updated CMake command. I’m having same issue as above. Also Python 2.7 and seeing install in dist-packages. I delete the ‘build’ folder and still problems persist when I try the cmake process again. Any other ideas you can suggest? I’m so close to the finish line! Two follow-up points that may provide some insight. I don’t actually see cv2.so file in either packages folder, even though I follow instructions to the letter. Also when I run workon cv I get an error message, that says “Error: deactivate must be sourced. Run ‘source deactivate’ instead of ‘deactivate’. I believe this is due to my anaconda python install, which I read would require me to run source deactivate instead of deactivate. Yet when I run workon cv, I indeed am in the environment and can open Python from here, so I believe that all steps are working up until my openCV cmake. Sorry that this is coming out in 3 separate comments! I noticed that I do have a cv2.so file – but it’s in my virtual environment. Is this OK? Did I do something wrong? It’s perfectly okay for the cv2.so file to be in your virtual environment. This might also be because you used Anaconda as well. I have the same issue, and it cannot be solved by simply deleting build folder. I check that ~/.virtualenvs/cv/lib/python2.7/site-packages/ does include cv2.so, numpy, and pip. I cannot figure out what actual problem is. Please share your opinion. What about build/lib? Can you check that directory and see if the Python bindings were successfully built? If they do not exist in build/lib, then the Python section of CMake was not configured properly. You are right. Is there any way to configure Python section of CMake properly? I have just installed cmake by the command “sudo apt-get install cmake”. 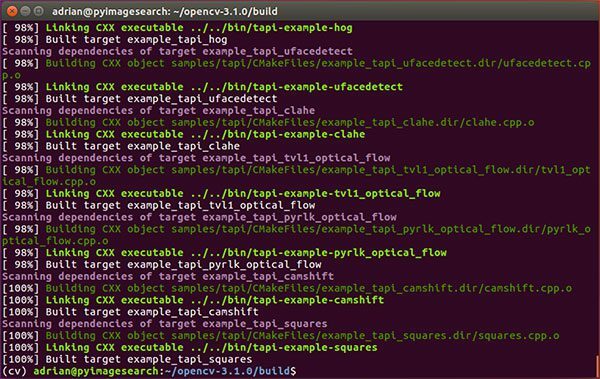 The section “Step #4: Configuring and compiling OpenCV on Ubuntu 16.04” covers how to configure the CMake command. I have plans on creating a more updated blog post with video tutorials and foolproof CMake configurations which should also help with getting OpenCV installed. In the meantime, I would suggest you take a look at the Quickstart Bundle and Hardcopy Bundle of my book, Practical Python and OpenCV. Both of these bundles include a pre-configured Ubuntu VirtualBox virtual machine that comes with OpenCV + Python pre-installed. It’s by far the fastest way to et up and running with OpenCV. I normally use pyenv to for my python environments, but when I setup the build it didn’t set the interpreter and libraries path correctly so I followed your tutorial and used virtualenv/virtualenvwrapper. But now it won’t find any interpreter at all. The vm is definitely activated and the “PYTHON_EXECUTABLE=” points to “/path/to/vm/bin/python”. Any idea what could cause this problem? PS: Really nice and detailed tutorial by the way! It’s hard to say what the actual problem is without having physical access to your machine. I doubt that pyenv would conflict since you are already explicitly inside the Python virtual environment, but at the same time I’ve always used both virtualenv and virtualenvwrapper. I would suggest double checking your virtual environment path. Thanks for these, Adrian! They’ve taken so much of the headache out of switching from Windows to Linux. Setting up OpenCV in Visual Studio was such a nightmare, that I dreaded trying to do it on Linux. Your tutorials made it a snap in Ubuntu and Raspbian both. One question / comment. If you’re going to use Python3, don’t you need to use pip3 instead of pip? I had a problem with numpy when importing cv2, but reinstalling numpy with pip3 seems to have fixed the problem. I’m happy the tutorials helped Scott! 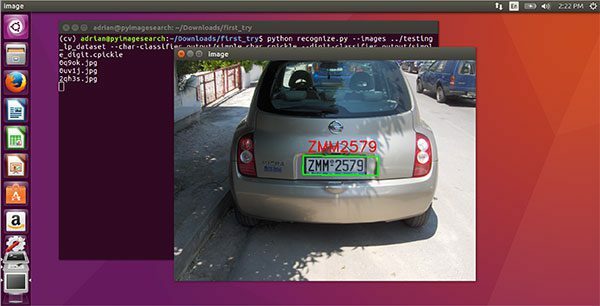 Once you make the switch over to Ubuntu/Raspbian it actually makes working with OpenCV and computer vision much easier. As for pip vs. pip3, once you are inside the Python virtual environment it doesn’t matter — the virtual environment correctly sets the pip version based on your Python interpreter for the project. Thanks for this great tutorial where I’ve learned a lot! Following the steps, I found that opencv doesn’t support cuda-8 so ‘make’ fails (giving “nppiGraphcut8_32f8u was not declared in this scope opencv python”). There is a bugfix on opencv repository but it’s not merged with master yet. Using that, I successfully compiled it with cuda 8 (takes about 20 minutes to compile). first, thank you for this great tutorial. although in the cmake report I got exactly the same output than yours in figure 3. I also double checked that numpy was installed in the virtualenv. Did you receive the error message during the CMake stage or the make stage? If you already have NumPy installed into the virtual environment AND your output matches mine then I would proceed with running “make”. I followed it with a fresh install of Linux Mint 18 (xfce desktop). I just had to install g++, i had an error during the Cmake step. Just want to become an openCV ninja ! Hi, Thanks for the helpful installation guide. i went through every step but still unable to use opencv..please help me out. its showing the error whenever i am trying to import. If you are having trouble importing the cv2 module please refer to the “Troubleshooting” section of this blog post. This section will take care of 95% of the common problems you may run into. after typing “make clean” and “make” i am not getting the output as shown in the step 4. There could be many reasons why you are not seeing the correct CMake output. Please see the “Troubleshooting” section at the bottom of this post for common errors. Hi! Could you help me? I can’t see “Libraries , numpy and packages path” 🙁 Only interpreter. It sounds like you are not in the “cv” virtual environment. Run workon cv before you run the CMake step and make sure you have installed NumPy into the “cv” environment. Hi Adrian, how would I go about using the virtual environment in an IDE such as IDLE? If you want to use an IDLE-like IDE, I would suggest install Jupyter Notebooks inside the “cv” virtual environment. Jupyter Notebooks are worlds better than IDLE. I came to report build problems on Ubuntu 16.10, but glad to see someone already posted the solution -DENABLE_PRECOMPILED_HEADERS=OFF , you may want to make that one standard. You should include unzip in the installs, while new Ubuntus take the view that libpng-dev should be the name of the current library (v16), fingers crossed no incompatibilities will pop up. Finally, I take the view that such a big build should be even bigger, and would recommend that java is enabled before cmake, eg by pulling “maven”, unless someone is absolutely certain they will do all their work in Python. The reason I don’t include -D ENABLE_PRECOMPILED+HEADERS=OFF standard is because it slows down the compile time. It’s only specific to a number of machines though. The vast majority of Ubuntu 16.04 systems I’ve installed OpenCV on do not require this switch. This switch has also already been documented both inside the blog post and in the comments section. You can use apt-get remove to remove each of the packages installed by apt-get. As for OpenCV, delete the source code directories and any file that has “opencv” in the filename inside /usr/local/lib. Is it compulsory to delete the directories after install?? You don’t have to, but it saves space. The benefit of keeping them around is that if you re-run “make” with different configurations the entire library doesn’t have to be re-compiled so it will save time. Hey Lucas — make sure you’re expanding the entire code block when copying and pasting commands by clicking the “<=>” button. You’ll notice that your URL will match mine exactly. Many thanks for your helpful tutorial! A short question, what is the difference between opencv and python-opencv? It seems easier to install python-opencv. Then why opencv is necessary? what is the extra features in opencv? I assume you are referring to the apt-get version of python-opencv? In short, don’t use it. It’s old. Outdated. And doesn’t have many of the features you’ll need when developing computer vision applications. For example, you won’t have any of the opencv_contrib functionality which any type of feature extraction algorithm will likely need. My two cents: I would recommend splitting these guides into Installation Guide for Py2..7, and one for 3.5. It’s overloaded and unnecessary to have both in a single place. Got it, that makes sense. Thank you for the clarification Jaan! am a beginner in this scoop and u really had explained lots of thing so really thanks for this blog, actually i have dozen of questions but let me start with one after i installed opencv with virtualenv i upgraded my python version , yet i can’t access neither virtualenv nor my new python version, another thing : i tried to delete all what i did but i couldn’t find how ? If you cannot access virtualenv or virtualenvwrapper hen please check the “Troubleshooting” section of this post where I discuss common errors or problems. Great Tutorial! It worked perfect, thank a lot! Thanks a lot for the brilliant tutorial. Works like a charm for me !! Fantastic! Congrats on getting OpenCV installed on your system Santhosh! To delete OpenCV simply delete any opencv* files in /usr/local/lib. Sorry, I guess image isn’t opening again. But, this check is my step, Libraries and Package PATH isn’t seeming. Hi, I tried again and this time I succeeded. I know that I am in dept to you a thanking, even though we were “unlink” 🙂 I appreciate your effort and your interest in people. Thanks again. Thanks for this post, recently setup caffe environments and other deep learning tools on ubuntu cost me lot of times. I think the war between py2 and py3 are due to backward compatibility, in the real world old softwares are very hard to upgrade, this need times(equal to money). Besides, most of the programmers and project manager(at least my experiences told me) do not like programming at all. Those people lost interest on learning new things, some of them told me they refuse to use the tools if that means they need to spend time to study. Consider the conditions of real world, It is not a wise decision to break codes when upgrading language version. Hi Adrian, thank you for this great installation tutorial. I have it installed on my Ubuntu 16.10 box and made some adjustment. I’m still inside cv. I checked and double checked. As for the libraries section, your path might be slightly different. Try to find the path using the ls command and auto-tab complete. It’s a pain, but if you work with it, you’ll find the correct path. I could only see Interpreter. Then, after I installed OpenCV with command sudo make install, all the .so files were placed under usr/loca/lib, not usr/local/lib/python2.7/site-packages. This may be because I missed packages path, but how can I fix this? This sounds like a CMake misconfiguration of some sort. It’s hard to say what the exact error is without having access to your machine. It’s normal for the OpenCV binaries to be placed in /usr/local/lib but the cv2.so file should be in the site-packages directory. If it’s not (and the compile succeeded) you can simply manually copy the cv2.so file into the site-packages directory. Same issue, no idea how to solve it. When looking at the CMAKE configuration it can’t even see the other python version so I don’t know how it ends up in the system python site-packages directory. Again, it’s a bit hard to diagnose this error without access to your machine but it sounds like you compiled OpenCV for one version of Python and then are trying to import it to a different Python version. Since the cv2.so bindings were not compiled for the same version of Python you are running into an error. Definitely go back to the “CMake” step and check the Python 2/Python 3 section — my guess is that the Python versions are not matching what they bindings are being imported into. Hi, Adrian. Thank you so much for this tutorial. I installed opencv on my ubuntu 16.04 machine using this tutorial with python 3.5. Could you also list out the steps to install matplotlib. I tried installing them following different links but they did not exactly work out. Where you getting an error when installing matplotlib? Or were the plots simply not showing up? If it’s the latter, you should refer to this blog post. This is well written, and easy to search visually, and it reminded me to do sudo ldconfig, which took my woes of not being able to run my programs after updating to opencv version 3.2, and completely alleviated them. Thank you for the tutorial , After following the whole process , I am able to setup with opencv in my ubuntu system , but it is running only on python 3.5 , since I am not able to find cv2.so in ~/usr/local/lib/python2.7/site-packages or ~/usr/local/lib/python2.7/dist-packages. If you would like to have the Python 2.7 bindings and Python 3.5 bindings then you’ll need to re-compile OpenCV with Python 2.7 support and copy the resulting cv2.so file into your Python 2.7 site-packages directory. Thanks for the tutorial. It is really very helpful. After running the cmake command, the instruction say to run make -j4. I can’t do that as I don’t see a makefile in my build folder. Any clue as to where I might be going wrong? If there isn’t a resulting make file after running CMake, then CMake exited with an error. Go back to the CMake step and resolve any errors with CMake. First of all: Thank you very much for this tutorial. The error that occured was some Glib-Object Warning. Everything i could find out was, that there are some troubles between libgtk2 and libgtk3 and libgtk2 is already installed. Changing to libgtk2.0-dev did the trick. Hey, I followed your tutorial to the point, but when i start python in order to test the install (in the cv virtual environment), i get a ImportError (ImportError: dynamic module does not define module export function (PyInit_cv2)) when i try to import cv2. I’ve run the tutorial three times now, to no avail (guess that makes me crazy, expecting different results). Any idea what might be wrong? Any help will be much appreciated! Are you trying to compile OpenCV with Python 2.7 or Python 3 support? The likely issue here is that you compiled the wrong Python bindings for the Python version you are using. what can i do? if it shows ” canot read from progress file? Hi Nikitha — what command is giving you that error? Hi may I know what is the difference between installing with this method and just simply typing sudo apt-get python-opencv ? Using apt-get to install OpenCV is not recommended. It will install an older version of OpenCV without the opencv_contrib modules, meaning that you’ll be missing on important functionality (specifically keypoint detectors and local invariant descriptors like SIFT/SURF). While it’s certainly easier to just issue an apt-get command, I don’t recommend this. It will cause more problems in the long run. Hey I get it worked when in terminal, but I would like to use it with IDE like wingIDE, but how to set ‘workon cv’ thing inside because the shell in wingIDE is already in python. I haven’t used the Wing IDE before, but all you should have to do is set the “Project Interpreter” like in PyCharm. Thank you for the kind words Joyce, I’m happy the tutorial helped! Man you are amazing!!!! Thanks for writing this. No problem Shubhankar, I’m happy it helped! For me import cv2 works but cv2.xfeatures2d doesn’t so I dont think that opencv-contrib install worked. I’m confused because I’m pretty sure that I followed all the steps. Any ideas as to what the issue could be? If xfeatures2d isn’t found then this opencv_contrib was not compiled. Double-check the path to your opencv_contrib in your CMake command and then ensure that xfeatures2d is listed in the “Packages to build” section of CMake output. Hi adrian, I checked my path it was fine, I didnt see xfeatures2d though. What do you think is going on? Without physical access to your machine I’m not sure what the exact issue is, but you should triple check your path to the contrib modules. I am 99% sure that is the problem. Thanks for the great tutorial! I had a problem with the output of my cmake not listing the libraries, numpy etc. I was most certainly on (cv) but I think the mistake I made was running pip install numpy as sudo unnecessarily. When I ran pip freeze as you recommended it revealed it was not installed properly in my virtualenv. I rm -rf ‘d my build dir and properly installed numpy and then specified my python_executable as python2.7 (as another poster suggested). And then run the remaining steps from within the “cv” virtual environment. How do I remove OpenCV properly to start again from scratch (the common answers on the internet didn’t help me yet)? I need to switch from 3.1.0 to 3.0.0 because the FlannMatcher seem to be bugged in 3.1.0 ( see https://github.com/opencv/opencv/issues/5667 ) and the solution is to modify the cv2.cpp file or go back to 3.0.0. As I couldn’t find the .cpp-file I tried to remove opencv via different methods which lead to the fact that opencv is now not working at all 🙂 . Did you successfully compile and install OpenCV? If so, remove all libopencv* files from /usr/local/lib. Otherwise, delete your “build” directory and recompile. I made it to the cmake step without any issues. I copied and pasted the cmake command into my terminal and ran it, and the output did not contain all of the things that you had in yours under python 3. All I had was the interpreter and nothing else. I double and triple checked to make sure i was in the cv environment so that was not my issue. I’m fairly certain I followed every step exactly, but I will run through one more time to make sure. Any idea why I’m only getting the interpreter with cmake here? It sounds like you might be using a different version of Python 3 than the one in this tutorial. What is the output of running python --version in your terminal? Very nice tutorial ! Thank you ! It’s a little bit long, but it works. In step 4, after creating directory ,Interpreter in Python2 and Python 3 is ON and not showing path.Can anyone help me to resolve this problem. Had problems the first go-round, so instead of wasting too much time, and since I was working with a more-or-less fresh install of Ubuntu 10.04, but thought I may have messed it up with other installs, I re-installed the O.S. and bingo, it all worked perfectly this time and I now have my virtual environments. Great stuff, thank you Adrian, I am now ready to march on my with my pyimagesearch gurus journey. My output of CMake is identical to yours. 1. Make sure that CMake exited without error. This is the likely cause of the problem. 2. If CMake completed successfully, make sure you are in the “build” directory when executing the “make” program. (1) Is it OK to install in another directory rather than $HOME, say /opt/opencv/ ? (2) Suppose I create _two_ distinct installation directories, say /opt/opencv2/ and /opt/opencv3/, and therein follow all the steps to install and compile OpenCV separately, one with Python 2.7 and the other with Python 3.5 (resp. binaries python and python3), could such a double installation work or would conflicts arise at some point in time? Thank you very much, in advance, for your help. 1. Yes, you can install OpenCV in any location that you would like. 2. This is (essentially) exactly what I do to install multiple versions of OpenCV + Python on the same machine. As long as you have separate virtual environments (or update your PYTHONPATH), this method works perfectly. what do you do if Python 2 and Python 3 Interpreter is missing content? just says “NO” next to the Python 2 and Python 3 result of “cmake” command. Make sure you are in the “cv” virtual environment before you are executing CMake, otherwise CMake might have problems trying to automatically determine your Python paths. Which Python version are you trying to compile OpenCV bindings for? tried it with both python 2.7 and python3.5.2! I am sorry to hear about the issue Anuradha, that is super frustrating. However, without physical access to your machine I’m not sure what the exact error would be. I am not being able to install the freenect(Kinnect) in “cv” virtual environment. I can use the library from outside the “cv” virtual environment but not from inside. Please help. I haven’t used freenect before so I don’t know where the output modules are, but I would suggest taking a look at the site-packages directory of your Python install. If they are there, copy them into the site-packages directory of your Python virtual environment. First of all thank you very much for the tutorial. But I don’t know how to make a link to the OpenCV file, could you help me? Hey Adrian. Nice as always. line do? Why is it necessary? This line deletes the cache directory for pip. If you installed virtualenv or virtualenvwrapper via sudo this directory may now belong to the root user than than the standard user. The command simply deletes the cache directory so it can be used by a normal user again (not strictly necessary — only necessary if you get a permissions issue, but good to include). How to set Interpreter , Libraries , numpy and packages paths. My cmake is successful but I see no such variables after python path. 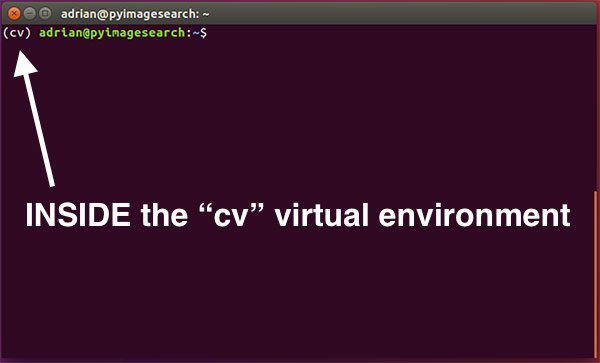 Make sure you are in the “cv” virtual environment prior to running the CMake command. I was able to install opencv 3.2 in ubuntu 16.04.02 and xubuntu 16.04 wihtout virtualenvs. However, I had to do a fresh install, otherwise it wouldn’t build for python3. Thank you. When i run cmake I cant find paths to interpreter, libraries and numpy. Make sure you are in the “cv” virtual environment prior to running CMake. Thank you for the great tutorial. In case that you have installed the ROS opencv3 package in your Ubuntu machine and include the ROS setup.bash in your .bashrc, you may hit an import error when you try using the OpenCV Python3 binding. This is because the ROS setup.bash sets the environment variable “PYTHONPATH” to its Python2.7 package path, i.e., /opt/ros/kinetic/lib/python2.7/dist-packages. To fix this, you may remove the ROS Python 2.7 package path from PYTHONPATH by adding the following line in ~/.virtualenvs/cv/bin/activate. Thank you for sharing Wei Ren! I am also trying to get ROS work with this install. I was wondering if you could elaborate a little more on how to get it to work. I did gedit on the file you mentioned and added the last line but i still cant seem to import rospy. How do I find ~/.virtualenvs/cv/bin/activate. ? Thanks a lot Wei Ren for this trick. It worked for me with ROS kinetic. I also want to thank Adrian Rosebrock for providing this wonderful opencv tutorial. Thanks a lot! I apreciate the effort that you put in did this amazing step by step tutorial for openCV, have a nice day! Thank you Sebastian, congrats on getting OpenCV installed! What is the difference between your guide to install opencv and “sudo pip3 install opencv-python”? The opencv-python package on PyPI doesn’t include (1) the “opencv_contrib” module which has all the extra goodies with OpenCV and (2) it doesn’t have “highgui” module support so you won’t be able to use functions like cv2.imshow to display images to your screen. I would recommend installing OpenCV from source. I’ve installed openCV per your tutorial. Worked great. However, I keep getting an error when I try to display an image on the computer screen per the example code in chapter three of your book practicalpython and open cv. Looks like I need the highgui, etc modules. So I guess I have to install via source? Can I use pip3 install opencv-python if I’m using python 2.7.x? Hi Frank — the issue is because you installed via pip install opencv-python. This method does not include the highgui module required to display images to your screen. I would suggest compiling OpenCV from source as I describe in this tutorial so you can display windows to your screen. After the installation — apparently everything has gone well –, I am not able to show images with imshow, I can use imread and work on the image properties but can not display it. Hey Manu — I saw your original CMake command. Your issue for (1) was that you left an extra space before -D OPENCV_EXTRA_MODULES_PATH and the start of the path. This caused the problem. You can specify the full path or the shortcut path. Either will work. Thank you very much for such detail! ippicv annoying me days! It’s interesting that there is a hash mismatch. Can you try either (1) re-downloading the source code or (2) installing via Homebrew? Skip all steps involving creating a Python virtual environment. Skip installing virtualenv/virtualenvwrapper. Don’t update your .bashrc file. Skip any steps involving “workon”. What a fantastically useful contribution to the world! Love this article. really great post..describe brifely each and every step with detail..what we actully doing..
install opncv without error..really thank you Adrian Resebrock.. I just installed the opencv3 & python2.7 on Ubuntu successfully according to your wonderful tutorial. The project I am going to do is about object tracking, and when I was calling cv2.Tracker_create(“KCF”), an error turned up: ‘module’ object has no attribute ‘Tracker_create’, also, when i try help(cv2.face), it also returns the same error. It sounds like you might not have installed OpenCV with opencv_contrib support. Double-check your CMake output to ensure contrib support is enabled. Also, make sure you download OpenCV 3.2 which is the latest release. I upgraded my Linux from 14.04 to 16.04 only to find that python2.7 failed to import cv2 also the upgrade rendered by /dev/sda to read only drive. to set that right and rebooted my machine. that did not make any difference to python. Still gave me the same errors when I imported cv2. I re-installed openCV on 16.04 under different virtual environment and all seems to be working now. Wondering if anyone has upgraded linux to 16.04 and are able to still work on their OpenCV installed prior to upgrade. In general I do not recommend doing major operating system upgrades on your development environment. Sym-links are bound to break, which is likely what happened in your particular situation. Are you inside a Python virtual environment or outside of it? If you’re inside the “cv” virtual environment you need to sym-link the cv2.so file into the site-packages directory for your “cv” environment. I will be covering emotion recognition inside Deep Learning for Computer Vision with Python. Thanks bro! works like charm! Great to hear Chaitanya, congrats on getting OpenCV installed on your Ubuntu system. Thanks for the wonderful work you have done. I run into a promblem after followed the step by step tutorial couple of times. can I sucessfully import cv2? I really don’t understand how the virtual environment works. and can’t find an answer. Really dont want to be stuck here. Do you have any idea of this? Really appreciate it . And then try to import your cv2 bindings. From there, take a second to read up on how virtual environments work. 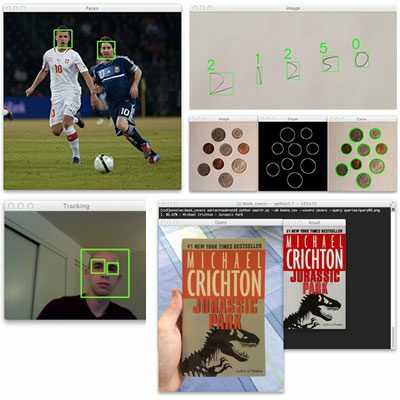 I am using OpenCV 3.1 and Python 3.5. I have configured properly the Enviorment and it is working fine by terminal. Now the question is this: how can I configure the same Enviorment that I am using with the Atom.io IDE? I haven’t used the Atom IDE, but I imagine it has a “Project Interpreter” setting similar to PyCharm. Update the Python interpreter to be your Python virtual environment and you’ll be all set. Thanks. I will have a look…..
Congrats on getting OpenCV installed Kaan, nice job! Hello Mr. Adrian , Firstly i want to congratulate and thank you for your excellent tutorials. I want to install use opencv with pycharm on my ubuntu 16.04. I use anaconda on my system for all python work. What steps should i follow to run opencv with pycharm on my system ? I tried this tutorial but make -4j command did not complete successfully. The first step is to install OpenCV on your system. Without knowing what your specific error is, I can’t point you in the right direction. Once you get OpenCV installed you can link to with PyCharm as I discuss here. Has the link changed ? Double-check your internet connection. The link is working just fine for me. If you create a Python virtual environment, you need to install Keras (and any other libraries you want) inside the virtual environment. Keep in mind that a Python virtual environment is separate and independent from your system Python install. I would suggest reading up on Python virtual environments here. Additionally, if you are struggling to get OpenCV installed, be sure to take a look at the Quickstart Bundle and Hardcopy Bundle of Practical Python and OpenCV which includes a pre-configured Ubuntu VirtualBox virtual machine which has OpenCV pre-installed. Everything worked till the very end except i didnt find my python 3.5 folder as stated in ‘usr/local/lib/python3.5/site-packages/’ . However, i did find my ‘opencv-3.1.0’ and ‘opencv_contrib -3.1.0’ folders. How do i overcome this problem ? Hey Arjun — I’m confused by your comment. You were able to compile OpenCV correctly, but the cv2.so bindings were not where you expected them to be? Or you ran into an error when running CMake or make? You would need to determine the Python library paths for your Anaconda install. I have never tried this with Anaconda so it might take a bit of trial and error. Hi thank you for your instructions. I got problems as when I imported cv2 in python 2.7. Could you help me with this, I want to run multitracker.py. When working with a virtual environment based on python3, for some reason after running camke to configure the build does not detect python interpreters. I had to run camke configuration on a virtual environment based on python2. That is quite strange that the CMake configuration didn’t automatically pickup the virtual environment for Python 3. I’m planning on writing an updated blog post that can automatically detect the proper CMake configurations. In the meantime, take a look at this blog post (even though it’s for macOS) as you’ll likely need to set Python 3 specific CMake parameters. Thank you, it works pretty good. Fantastic, I’m glad to hear it Esteban! Never mind, I figured it out. Thanks though. Congrats on resolving the issue Yashas! Thanks for the excellent tutorial Adrian and congrats for the great work you’re doing on PyImageSearch. A little tip: I had an issue with the ‘confidence’ value when trying to use the predict function from the face recognition modules (by using eigenfaces). The issue is explained here: http://answers.opencv.org/question/82294/cant-get-predict-confidence/. If someone will use the ‘confidence’ value in future I suggest to take a look at the link above before build the OpenCV, so you can change the face.hpp file to provide the ‘confidence’ value as explained by Berak as a workaround. This is great, thank you so much for sharing! Adrian, thank you a lot! Great article. I installed everything without any problems. However, I would kindly ask you several questions, just in case if you will have time to answer them. 1) We installed opencv in a given virtual environment, however ‘make install’ placed .so file into system-wide site-packages directory of python 3.5. – Why not in virtual environment directory? – If so, why system-wide python 3.5 installation cannot import opencv even if .so file is present in its site-packages directory (/usr/local/lib/python3.5/site-packages). I understand that build process was specifically tuned by the virtual environment modules which may not be available on a system level, but installation places all the files into system-wide directory and it rises this question (naturally, system-wide python should not be able to run opencv installed inside virtual environment because but I cannot figure out how this isolation is guaranteed). 2) All the story behind virtual environment is to have isolated dependencies. – How can I install another different instance of opencv for a different virtual environment (for example, 3.0.0 or 3.1.0 without contributions or opencv built for different numpy version)? – ‘make install’ will place another .so file into /usr/local/lib/python3.5/site-packages and here the conflict comes. Am I right? 3) When we install system-wide pip – is it installed per specific python version or for any python version particular system has (I guess the latter)? How does this process work? 4) If I update global version of pip or python. Does my virtual environment keep old versions? 5) What do you think about python’s own implementation – venv? Is is better/worse than virtualenv+virtualenvwrapper, in your opinion? Appreciate your attention and help. Great site! 1. You can install the cv2.so files into your Python virtual environment, that’s not an issue at all. It requires changing the site-packages flag during CMake, but that’s the only change that is required. 2. The easiest way to do this is to create a separate Python virtual environment for each OpenCV install. Access the individual Python virtual environment. Run CMake + make. Then copy the resulting cv2.so files from your build directory into their appropriate site-packages directories for each Python virtual environment. This is exactly how I organize my installs. 3 and 4. Pip is first installed systemwide. Once you create a new Python virtual environment a new version of pip is used. Therefore, you can upgrade or downgrade pip and other packages from within the virtual environment. 5. I personally think virtualenv+virtualenvwrapper is easier to use, but that’s my personal opinion. Thank you a lot for replies, Adrian. Have a nice day! I’m glad to hear it Akash! Congrats on getting OpenCV installed on your Ubuntu machine. mkvirtualenv cv -p python2 command like me. Results from this post on stackoverflow https://stackoverflow.com/questions/38794015/pythons-requests-missing-dependencies-for-socks-support-when-using-socks5-fro that is related to one proxy enviroment variable (for who use a proxy for internet connection). I’m having trouble installing and finding the libjasper-dev and libpng-dev modules. When I try to install them with sudo apt-get install, I’m told that the package can’t be located or that the version has been obsoleted (for jasper and png, respectively). Any tips on how I can find and install these libraries so I can get started? Try running sudo apt-get update to refresh your package repositories. Hey Adrian, I’ve followed you instructions and the environment works as expected – Thanks a lot. There is one more issue though – when I enter the virtual environment I cannot import packages that are already installed such pylab even though that it possible to import them in other python regular shells and vice versa (cannot import cv2 to regular python shells). Hi Italy — I would suggest reading up on virtual environments more. By definition, a virtual environment creates a separate, independent Python environment from your system install. To install any new packages into the “cv” virtual environment, simply access the environment via the workon and install your packages via pip. What command is giving you that output? I followed the instructions. Installation went smoothly but at the end /usr/local/lib/python2.7/site-packages is empty. I would double-check your build/lib directory and ensure the resulting cv2.so file is in there. If not, there was an error in your CMake configuration and the Python bindings were not built. I cannot download virtualenvwrapper for some reasons…. What is the error message that you are getting when you try to install virtualenv/virtualenvwrapper? I have installed python 2.7.13. When I followed all the steps mentioned above skipping the virtual environment creation, I could do everything perfectly fine. But, python2 output from step 4 doesnot contain libraries, numpy and packages. Rather python3 contains it. Not able to understand why is it happening!! I did buy the book from you. I have successfully install open cv. Thank you. Now to get this to work with a python IDE…. Thank you for picking up a copy of Practical Python and OpenCV! As far as a Python IDE goes, have you tried PyCharm? Used pycharm . I am at Chapter 10 in a day !! Thank you . Let me finish the book with the Case Studies. I think I owe you a big recommendation some time this week!! Congrats on getting all the way to Chapter 10 in a single day, nice job! Glad I could help, Sridhar! I just wanted to know if I should pip install SciPy and scikit-learn before executing cmake or can I still install them after following through all the instructions above. You can install scikit-learn before or after installing OpenCV, it doesn’t make a difference (just make sure you install scikit-learn into the “cv” virtual environment). One question: why do you have to rename the cv2.so file? Why doesn’t simply creating a hard link or soft link to the original long file name work? You could create a sym-link for the cv2.so file, that is also perfectly acceptable. I personally prefer for the files to be (correctly) named cv2.so. I just confused about the virtual environment. I am only working on c++ project now, if I install the cv2 using this virtual env way, does my c++ project can find the cv2? So I know I have to install OpenCV, but c++ doesn’t have virtual env, right? This method will install your OpenCV C++ headers, but C++ does not require the virtual environment (that is for Python only). Sorry but another question about the virtual env. If I want to install another app using virtual env, e.g., Tensorflow, in env “tensorflow”. Does the env “tensorflow” know there is an OpenCV installed in the machine? Are you referring to C++ or Python? Keep in mind that this is a Python-based blog so I kindly ask that all questions are related to Python to keep comment discussions on track. If you have a question regarding C++ and OpenCV, I would suggest asking on the official OpenCV forums. I was trying the installation of opencv by your method, but my operating system is not having the required space in the root mount.So I’ll increase the size of my root, and want to try out a fresh installation, and want to remove the files and libraries download and installed. My build process is not getting completed due to no space in the disk. I want to remove all the libraries and files downloaded prior to that. Kindly help how to remove them. All you need to do is delete your “build” directory. Then create a new “build” directory after you have increased the space of your system. This is an amazing article. Many thanks for all the hard work and attention to detail that went into making it happen. Quick question, I performed the installation procedures on root, but is it possible to enable other user accounts to leverage the environment? Congrats on getting OpenCV installed, Julio! Nice job. As for your question, if you installed OpenCV into /usr/local then yes, other users will have access to the OpenCV + Python bindings. However, you will need to create a Python virtual environment for each of the users. So, to enable opencv + python on a non-root user, should I follow this tutorial again in a new virtual environment for the new user? Or is there a way to copy it from the root venv to a new venv? You can actually access the Python virtual environment for another user via root. Please see this blog post for an example. Hi Adrian. I have a problem. I am installing opencv3.2 using virtaulenv (python3) on ubuntu. Just an update. If a comment out the ROS stuffs from the .bashrc file it works. But I do not know how to make it works together. It sounds like you compiled OpenCV with Python 2.7 support, but are trying to import it into a Python 3 shell. Keep in mind that you need to configure CMake such that it compiles OpenCV for the Python version you want to use. Python + OpenCV bindings are not compatible across different versions. You need to re-compile and re-install OpenCV for each version of Python you want to use. For those, who faced with the same issue. It’s actually kindly explained by Mr Wei. I’m copying it with a ROS and ImportError tags. In case that you have installed the ROS opencv3 package in your Ubuntu machine and include the ROS setup.bash in your .bashrc, you may hit an import error when you try using the OpenCV Python3 binding. This is because the ROS setup.bash sets the environment variable “PYTHONPATH” to its Python2.7 package path, i.e., /opt/ros/kinetic/lib/python2.7/dist-packages. To fix this, you may remove the ROS Python 2.7 package path from PYTHONPATH by adding the following line in ~/.virtualenvs/cv/bin/activate. just by putting it under the code the problem gets solved. Without it does not link to its contrib modules! Hi Alexey — perhaps I’m misunderstanding your comment, but the -D OPENCV_EXTRA_MODULES_PATH flag is included in the CMake command in this blog post. No, it is just OPENCV_EXTRA_MODULES in the blog post. Took some time to find that one should append _PATH as well. 1) cmake is running fine, but I can’t see the libraries , package path or any other sub-heading in the output. There was no error during cmake, only the output is not as expected. 2) site-package directory is empty and dist-package also has no files of opencv. I’ve repeated the procedure multiple times,it’s still not working. Any help would be appreciated. Hi Shivani — make sure you are in the “cv” virtual environment before executing CMake. You should consider delete your “build” directory, re-create it, and re-run CMake. I dont know what to do. I need to mention that I checked configuration and the extra Tracking Package was included. I have the same issue. I made sure that I had the correct capitalization. I can also run the tracker example in opencv-3.2.0/build/bin just fine. Any ideas or things to check would be much appreciated. Can you confirm that you installed your Python + OpenCV bindings with the opencv_contrib module? That could be part of the issue. Run the above command, delete your “build” directory, re-create it, and re-compile. I did install the video support, still I’m facing the same errors as mentioned by Ron. Can you please help in this? Note: I’m doing this on VM of Ubuntu 16.04 (Guest) on Windows 10 (host). Not sure, what is missing? I used both opencv and contrib version 3.2.0, but cmake command had path of 3.1.0. So, when I fixed the version, it worked. Congrats on resolving the issue, Vivek! Nice job getting OpenCV installed and working. Hi Vivek, I have the same issue now, how did you check and change the path of cmake command? But how am i supposed to use opencv outside the “cv” virtual environment ? Suppose i needed to do it ? If you installed OpenCV globally into /usr/local you should be able to use OpenCV with Python outside the virtual environment. Hi, I believe I may have missed something. when I navigate to the folder Python3.5 > Dist packages, it is empty. However Python 2.7 > Dist packages has contents. reason being is I am having the issue of cv2 not found. I’m sure I went through all the steps. Is there a way to restart the process without havibg to start from step one? Iv’e not uninstalled the zip downloads. The easiest way is to simply delete your “build” directory, re-create it, re-run CMake, and re-run make. There is no need to start from Step #1. Thank you very much for the tutorial, Adrian 🙂 I used pyenv-virtualenv so it needed a bit of tweaking but it works. I was wondering however: we have created a virtual environment (cv) which has numpy and which is used by opencv. However, I will potentially have different computer vision projects in my machine, and each one of them should have an independent virtual environment. However, newly created environments don’t have access to cv2, as expected. Simply sym-link the cv2.so file into each of your newly created Python virtual environments (no need to recompile). From there you’ll be all set. Fantastic, I’m had to hear it worked 🙂 Congrats on getting your system up and running with OpenCV. Hi, Adrian. What a thorough tutorial! My autistic brain thanks you. I am having a small problem installing OpenCV in Python 2…in Step#4 I execute cmake, and my packages path points to Python3.5, while all other paths point to Python2.7, which I’d rather use. I also get a couple of error messages, telling me that “no package found”, and “Configuring incomplete, errors occurred”. If you are getting issues related to “Configuring incomplete, errors occurred” scroll back through the CMake output. It will tell you specifically where the errors were. You can also check the CMake errors log. You could do a python and opencv tutorial for debian .. Does not work on debian ..
Hi Walter — Ubuntu is Debian-based. I’ve used this tutorial myself to install OpenCV on Debian machines. What is the issue you are running into? This is the best tutorial I’ve found for installing OpenCV in Ubuntu. Thanks! I installed PyCharm on the virtual environment and it all worked just fine. Thanks John, congrats on getting OpenCV installed! Hey Adrian, thanks for the great tutorial. I have followed this tutorial couple of times since I have found it. But recently I am trying to install it on a machine remotely where I don’t have sudo permission, which is why it is failing now. Also I am not that good with compiling using cmake etc. Can you please guide me what should I do in that case. Thanks. Hi Muaz — you will need sudo permissions to install the proper pre-reqs for OpenCV via apt-get. Otherwise, you would have to manually compile the pre-reqs by hand and install them into your local home directory. I do not recommend this as it’s a major pain. Hi Adrian! First, I would like to thank you for this succinct tutorial to install OpenCV 3 on Ubuntu 16.04. “No module named cv2” and “No module named numpy”. How do I fix this? Do I need to configure my IDLE? I want to use IDLE for writing the programs in a similar fashion which we use it in Windows. Let me know if there’s a solution to this. IDLE cannot access your “cv” virtual environment, hence why you cannot import “cv2” and “numpy”. If you want to use something similar (and better) than IDLE, I would suggest using Jupyter Notebooks. So even the Jupyter Notebooks need to be installed on ‘cv’ environment? Correct. Please keep in mind that a Python virtual environment is totally and completely independent of your system Python install. If you are new to Python virtual environments (and why they are useful and a best development practice), please refer to this post. Can we install Scikit for Machine Learning? Do we need to install Scikit in the cv environment or normally in the system environment? From there copy the cv2.so (or sym-link it) into the site-packages directory. From there you should be able to import your OpenCV bindings. If “workon cv” puts you in the virtual environment, what takes you out? Just plain old “deactivate”? or something special? You are correct — deactivate removes you from the virtual environment. Hi, I’ve tried to copy manually the cv2.so in site-packages system and cv2 environment like you said in FAQ but can’t as it is already there. but still have the error “no module named cv2” in Pycharm. I’ve found a new version of opencv and opencv-contrib that says can intergrate with Pycharm IDE here https://pypi.python.org/pypi/opencv-python but I don’t know the correct steps to do like in this tutorial you written. Can you enlighten me to resolve this? I’ve been stuck for days now. Thank you. So you’re using PyCharm as your IDE? If so, you just need to configure your “Python Interpreter” for the project. Please see this post for more details. Thank you man, I followed your guide step-by-step and it works! Even in a Virtual Machine! I tried to do the same with an Ubuntu 17.04 but it failed. Anyways, thank you. Congrats on getting OpenCV installed on Ubuntu 16.04! I haven’t tried this guide yet with Ubuntu 17.04. I would be curious to know what step the build errored out at. Thanks for this guide, it saved me a lot of time! I’m glad to hear it Jeremy! Congrats on getting OpenCV installed. but the virtual enviroment went to the python 2.7 folder , not the 3.5! Definitely double-check which Python version you used to create the virtual environment. I realized I had to add this line to cmake -D WITH_FFMPEG=OFF\. Then it works. I don’t know when I disable ffmpeg what features I will lost when I use OpenCV? FFMPEG is typically used for various video file codecs. I rarely compile OpenCV with FFMPEG implicitly enabled so unless you are looking for specific video codecs you won’t lose much. Thanks for the tutorials! I’m currently encountering a problem with videocapture function of cv2. The ‘ret’ value is always false when using cv2.videocapture. Just wondering, if this is the issue related to ffmpeg compilation? Hello Carol, I wonder whether you have solved your problem? Adrian, I appreciate the time you’ve spent preparing this tutorial and responding the comments you’ve received. I’ve read your tutorial line by line, trying to understand each step. I am still pretty much clueless, but its not your fault: I am utterly new at Ubuntu and Python (OpenCV is pretty much Chinese to me at this point). I have a lot of questions, but I’ll only ask the one that’s been bothering me the most: If the idea is to have OpenCV working in a virtual environment, why isn’t everything done within it? I guess another way to phrase the question is: Why isn’t the creation of the virtual environment step # 1. If I’ve understood correctly, OpenCV has been installed in the Home directory, and the build has been made inside the OpenCV file. I know my confusion stems from a lack of understanding of how virtual environments work. I read the links you referenced regarding this matter, but they aren’t clear enough for a newbie (or plain simple idiot) like me. I would GREATLY appreciate it if you could shed some light on all this, and if you could be so kind, give me a reference to understand the mechanics of python paths and dependencies in the context of Ubuntu. Hi Simon — the virtual environment only affects your Python PATH (a system variable). Installing dependency libraries via apt-get (such as those for image I/O, video I/O, optimizations, etc.) do not affect Python. Again, Python virtual environments will only affect the Python path on your system. hey Adrian, thanks for this tutorial! as usual, awesome work pal. The SIFT class changed from OpenCV 2.4 to OpenCV as I discuss here. So you might update the links, even though GitHub just redirects the old one with 301 (moved permanently). Thank you for the fantastic tutorial. I have the similar issues with the configuration of cmake. Always delete the build folder if the call to cmake was not perfect (results as in your picture). Then make fresh build folder, cd into it and call cmake with proper parameters. Thanks Jan! And yes, you’re absolutely right — to restart your compile from scratch the easiest method is to delete your build directory, re-create it, and then re-run “cmake”. Thanks for chiming in! Any ideas how to compile to avoid this problem? I’ve the same issue, How did you resolve it. I tried to install opencv with your guid in ubunto 16.04. I upgraded ubunto and now i have ubunto 17.04 on my machin. When i run my code from command terminal it works fine. But when i configure it by qt it crashe when i use namedwindow. Is it becase of upgrading my ubunto to 17.04 or an other reason cause crash?? Hi Nader — I haven’t tried this tutorial with Ubuntu 17.04, but in general, upgrading your OS is likely to break the development environment. If you want to use Ubuntu 17.04 I would suggest starting with a fresh install of Ubuntu 17.04. Thanks for your answer adrian. I use opencv 3.3 and qt 5.9. But my problem does’nt resolved. Actually when use namedwindow or imshow or waitkey, programm crashes. I feel that opencv 3.3 does’nt works on qt or is not cofigurable with qt. I haven’t used OpenCV with Qt in quite some time, but you can compile OpenCV with Qt support. I typically used GTK-based GUIs so I’m unfortunately not sure what the exact error is. I’m getting a fatal error: linux/videodev.h: No such file or directory error. I checked /usr/include/linux directory and can verify I only have a videodev2.h file. I’m getting the same error for videoio.h. I’m currently trying to install in a 16.04.3 VM. I have successfully installed all the packages required. Maybe something changed in the packages since this write up. If not, install them, delete your “build” directory, and then re-run CMake and make. what would I do ??? I would suggest using Sublime Text to write your code and then executing the code from your command line within the “cv” virtual environment.